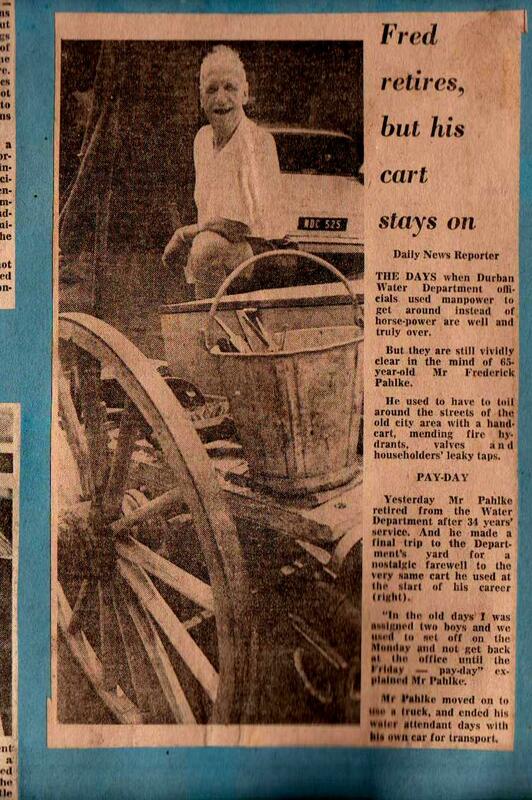 Continuing with my late father-in-law, Mr Archie Black’s newspaper scrapbooks, here is what he pasted up for 1966. Mr Black posted some headlines which were international news so I will include some of them for interest. My comments in italics. Mr Black’s scrap books ended at 1975 so there is no scrapbook for 1976. The New Year started with a Rand 90 000 Aero Commander light aircraft crash landing in the surf near Virginia Airport. The pilot, Mr Graham Wulff and two passengers were uninjured and the aircraft was recovered from the surf. A spiral ramp and bridge across the Bay to the Bluff in the vicinity of the Point and North Pier area is proposed. The ramp would lead from Escombe Terrace and spiral to a height of 70 plus meters and cross the Channel with a 200 meters span to the Bluff. The spiral in circling would provide for a sports stadium seating 75 000 to be built within it. In addition a mono-rail system could be incorporated in the scheme. The proposal came from Councillor McManis. (The present Point Development Scheme is the area that was to be used in the proposal. Spanning the Channel to create a short cut to the Bluff was often mooted either overhead or underground. If I recall a tunnel was once proposed. These never materialised but I suppose one day you never know. Monica Fairall (now passed on) wins the Personality magazine , Queen of the Surf title. SAS Inkonkoni , Durban’s South African Naval Reserve base was conferred with the Freedom of the City. Dr VL Shearer, the Mayor of Durban took the salute at the march past. The freedom scroll was handed to Commander SHC Payne, commanding officer of the oldest naval reserve in the world. A proposed drawing of the new Athlone Bridge across the Umgeni River is pasted up. The old Athlone Bridge, an iron girder bridge is no longer able to carry the normal daily load of 12 000 vehicles and corrosion has deteriorated to the point that it is considered no longer viable. The new bridge would be built close to the old Athlone Bridge and would be a reinforced concrete structure supported over the river on 4 piers mounted on suitable piled foundations. The spans would be 315 feet in length. The cost is estimated at R800 000 and construction time of 18 months. (From Origin of Durban Street Names: Athlone Bridge runs from Athlone Drive across the Umgeni River to Durban North. Built by the Durban North Estates Company it was named to compliment the Earl of Athlone, Governor General of the Union of South Africa. The bridge was opened by the then Mayor of Durban Councillor H.L. Buzzard in November 1927. Miss Monica Fairall enrolls at University of Natal as a B.A. student and is chosen as Miss Freshette for 1966. Her two princesses were Valerie Hook and Sue Rogers. Dennis Vorster is attacked by a shark in unprotected waters off Umkomaas. Mr Aubrey Roberts marries Miss Kerry Barends at the Emmanuel Cathedral in Durban. Aubrey was a leading jockey at the time and his bride was the daughter of Mr and Mrs Charlie Barends. Charlie was one of Durban leading jockeys. Gary Player and Jack Nicklaus arrive in Durban to play their fourth match in a six match challenge series. The game is played at the Durban Country Club course. The “Tickey” is Dead! The Minister of Finance, Dr Donges announces that the tickey will no longer be minted. The coin had diminished in use as it conflicted with the decimal system that had been introduced in 1961. It was the only coin of the old coins that continued to be issued as its strength was the fact that public telephone call offices and parking meters used the coin. However these had now risen to 5 cents and it became obsolete. The coin was first minted in 1923 and since then 134,631,953 tickeys were minted. The most valuable is the 1931 tickey as only 128 were produced. In 1966 the 1931 tickey was valued at R100! (The tickey, three pence or thrupence , 3d, in value was the smallest silver coin minted in South Africa. It was worth the equivalent of two and half cents in the decimal system. The new road bridge across the Umtamvuna River linking the lower Natal South Coast and the Transkei is nearing completion. The 8100 ton South African ship SA Seafarer runs aground off Mouille Point in Cape Town. Diminutive Tommy Malone, a Scottish immigrant won the 41st Comrade’s Marathon. It was his first attempt. He romped home in 6 hours 14 minutes and 7 seconds — 17 minutes and 35 seconds outside Jackie Mekler’s record time but 17 minutes 39 seconds ahead of Manie Kuhn (2nd) and Fritz Madel (3rd) . The race was Durban to Pietermaritzburg with 404 starting and 365 finishing. Max Trimborn uttered the traditional cockcrow to get the race started as the Durban Post Office Clock struck 6 am. The Freedom of the City was conferred on the State President , Mr C. R Swart. The Durban July favourite, Sea Cottage is shot and seriously injured by an unknown gunman as the horse was being taken to the Blue Lagoon Beach for an early morning run. The horse was shot with a .22 calibre revolver fired from the Ellis Brown Viaduct. Durban High School celebrates its centennial year. A big celebratory programme is arranged. Centenary Day is June 1st when Smith Street will be closed and a procession of pupils and old boys will march from the original school site, opposite John Orr’s in Smith Street to the City Hall. Here the school cadets will perform a retreat ceremony and this will be followed by a civic reception. (This building at one time served as the Smith Street Police Station. In later years it was left empty but because of its historic background was not demolished. When last I saw it was still there but abandoned . ) On June 2nd, an evening braaivleis will be held at the School grounds followed by a huge fireworks display . The school badge will also be fashioned in fireworks and lit. On June 3rd celebrations will be at the school which will be open for inspection. Various school departments will have exhibitions and displays. In the afternoon will be a mass PT display by the pupils. Later unveilings of the 1894 foundation stones and the new Centenary gate posts will take place. In the evening the Old Boys Centenary Dinner will take place at the Durban Country Club. On June 4th, a rugby festival will be held against the school’s old rival Maritzburg College. In the evening a dance will be held for pupils at the school and the Old Boys Centenary Ball will be at the City Hall. On Sunday June 5th, a thanksgiving and wreath laying ceremony will take place at the school.On March 19th and 20th, a cricket match between old Boys and Natal was arranged. The book, The DHS Story 1866-1966 is published. Dr. Hendrik Verwoerd is assassinated in the House of Assembly . His successor is Mr John Vorster. Jock Leyden writes a tribute to Walt Disney marking the death of this giant in the cartoon world. The Aberfan tragedy occurs in Wales. A landslide of coal rubble engulfs a small town . Amongst the casualties are 100 children whose school was in the path of the landslide. The Swedish tanker Malmohus limps into Durban Harbour with a 55 foot section of her bow missing. She has 40 000 tons of crude on board which fortunately does not leak. The crude is transhipped before repairs are undertaken. Sandjeford, a Durban yacht returns to her home port after a two year round the world trip. The Southern Freeway construction gets to the stage that a ramp is to be built to direct traffic from the freeway to the Esplanade. A circular ramp is proposed which would be situated roughly over the Tropicale Restaurant and adjacent to a block of flats, Anacapri in St Andrew’s St. Opposition from the tenants in Anacapri has the ramp moved away from both the block of flats and the Tropicale to a new position. The Musgrave Road Congregational Church on the corner of Berea and Musgrave Roads has to make way for the new western freeway. The Church has been on this site for 80 years. A mechanised painting system of applying road marking lines is demonstrated for the first time on a section of the Southern Freeway. The Italian cruise liner Eugenio C enters Durban Harbour for the first time. Donald Campbell is killed on Coniston Water in England when his speed boat, Bluebird somersaults, explodes and sinks during trials. A Durban man commits suicide by driving his car into the Bay off the wharf at Island View. Strangely Mr Black did not paste up who won the Dusi Canoe Marathon like he usually did nor did he record who won the July Handicap. The scrap book also ends abruptly as quite a few empty pages are found at the end which is unusual. Hi Mr Buttigieg. I worked under you at the 37 exchange and was friends with a man named Roger but can’t remember his last name. Could you help. Andre ? Andre Shrauwen perhaps? Roger Dell worked with me in Beach 37. Last I heard he was still alive and working in the KZN Midlands. He can be contacted via Glenn Woodley (also Beach 37 staff); I may be able to get hold of Glenn. Very interesting read by chance. Pleasantly surprised to see your name and remember you from the rindapest days(ha ha). Peter Johnson, of Carl Court fame? Yes from way back. Wasn’t it Speedwell Court , Innes Road ? Remember Stella quite well. Hi Gerald, thanks for the great site. The tug T. Eriksen was gashed by the prop of the Angola & sank in minutes. 3 crewmen went missing. The Railway divers, in their copper helmets were the first to examine the scene, but could not enter the tug, so they called on the aqualung divers.. I was asked to search the tug for the bodies. Body jobs are horrible. You want to find them for the relatives, but you hope you don’t because it is very disturbing. I recall I got to miss the last day of school ( DHS 5th form) to do the job. The water visibility was about 1 ft, I could see my hands in front of my face, but not at arm’s length. The tug sat upright on the bottom , so navigating my way around was easy, even though it was pitch dark once I was inside the vessel, so I searched by feel. In the accomodation everything the could was floating, mattresses,bedding, gear bags & furniture all tangled together. I first felt my way around each cabin at deck level, then searched the bunks, & then headed up to the floating debris,feeling all the shapes, not really wanting to grab a body. My heart did once skip a beat when I found a boot that did not move when I pulled on it, but I breathed a sigh of relief (underwater) when I tugged it free & there was no body attatched. I reported there were no bodies in the tug, they were found at Maydon wharf a few days later. The picture of the sunken Eriksen was front page news, with me ( a small blotch) circled as ” a diver”. Sorry your post got lost somewhere and I only found it now. Interesting you did the dive work on the T Eriksen. Did she sink in the channel ? Do you have any pictures? Cyclone Demoina was in 1984 not 1987 as far as I recall as I filmed some beach scenes on a video camera when I lived in Durban at the time. I moved to Pmb at beginning of 1986. Can anyone recall the name of the hypnotist that had several seasons at the theatre in Umbilo ( was it Lyric theatre?) in early 70’s or maybe late 60’s? The name Romark comes to mind, but not sure if correct. I googled Romark and there was a hypnotist by the name in UK in ’70s that apparently cast a spell on a football team, but no mention of visits to SA. Indeed, it was Romark ( Ronald Markham ). In the late 90’s and early 70’s I spoke to him many times at the old Natal Tattersalls in Field street, as he was quite a big punter!. He did perform at the Lyric, City Hall and can remember him doing a show at the sunken gardens Amphitheatre at the North beach. I attach a few websites below for you to look at. The first one has a picture of him about half way down the page. A character to be sure!!!! Hi Mike, Romark (Ronald Markham ) Show “Romark” ran at the Lyric Theater During 1972. ( I remember timing well as the show closed in December 1972 as i was conscripted to the military in January 1973) At the time it was registered in the guinness world records 1972 as the longest running one man show. Myself, Francois Muscat, John Bukes, Lynne Baxter, Rodney Ritson, and a few more all worked as assistants in the show. Both Rodney and John performed the hangman act. I often performed as Cedric the monkey (storing nuts where a monkey keep them) and also as Dracula flying over the orchestra pit into the ordinance. There was also a horse he was in partnership with called Romark. Your best bet is to contact Independent Newspapers in Durban. They will have the archives of the Mercury, Daily News and Sunday Tribune from that time. I don’t know how helpful they’ll be but if you don’t have any luck there, you could try the Killie Campbell and Don Africana libraries (also in Durban) which will have those papers on microfiche. Hope this helps. To all those that wonder about Tommy Burns – I remember Tommy Burns, who miraculously survived. I lived in Elwyn Court at the time. They were on the 7th floor. I used to babysit occasionally when I was 13/14 – there were numerous little children in that family!! Just to be clear, Tommy did NOT fall out the window whilst on my shift!! It happened during the daytime. Hi Alain- it is the same one! How and where are you? Wow, what a chance crossing of paths! I now live in Melbourne, Australia. Been here for 16 yrs now. Moved to joburg in 1970, married Avril 43 yrs ago. We have a daughter living in Ballito and the other in Johannesburg. I can’t remember when I last saw you. It must be in 1966? Wondered where you had moved to. Don’t know how to give you my email address via this site. Not so tech savvy. I do not want to clog this site with my personal correspondence. I have forwarded Peter’s address to Alain. It was in 1960 that the Durban City Council lifted the ban of bikinis on Durban Beaches. I would say probably the last beach in the world to do so. I looked through the 1960 Scrapbook but there is no picture of your sister only Miss South Africa in a bikini of that time. I looked up my 1965 Durban Directory and found 4 Magnussens living in Durban. Maybe related? They were B Magnussen, Rev. E Magnussen, G.R.W.Magnussen and R.W. Magnussen. All I got for you. There are archives of Durban newspapers but I would not be able to access the archives as they are not available on the internet as far as I know. Seeing GRW was your father I can tell you that the family lived at 123 Beacon Road in an area called Grosvenor on the Bluff. Their house was the last on the right hand side Number 123. I would say it is still there so you could look it up on Google Earth. Well done Gerald. again you have made someone happy. Thanks Graeme. There is gratification in filling in blank spaces for people especially when they are far away and they are made aware of information they never knew no matter how insignificant it may be. Myra lives somewhere in Australia so thanks to this thing called the internet so much can be achieved. In the funeral notice in the scrap book for Frederick Pahlke is there a date of his death as I am doing my family tree and my uncle Freddie (Frederick) is the only one of his siblings that I do not have a date of death for. Please if you do not mind could you give me the dates etc and hopefully a copy of the funeral notice, I would appreciate it so much, I can to add it to my genealogy records. I have forwarded your email address to Gerald and I’m sure he’ll contact you directly. Allan. As to Sharleen Nell’s comment here is the associated newspaper cutting pasted by Mr Black in his Durban Scrapbook 1975. How ironic that you should mention Graham Wulff. I remember that accident and I have faded colour photos of the plane on the beach. It was a total loss. Its registration was ZS-ANI. I also went to school with Graham’s two sons, Graham jnr and Garth who had a pilots license. There were two Aero Commanders based at Virginia airport , one of which was owned by the late Robbie Robinson and Graham’s next plane was a new Aero Commander registered ZS-CBC. I flew with Graham and a friend of his plus Garth and myself to Queenstown over the weekend in May 1968 . We stayed at the Hexagon Hotel and on the Sunday morning , we departed to Graham’s holiday home up at Drakensberg Gardens . After lunch we took off and 33 minutes we touch down back at Virginia Airport. I started my flying career in 1968 and today am now running my own business along with my partner, in Perth Australia where work took me to Melbourne originally before moving back to Perth in 1983. We own nothing but Aero Commanders in our fleet of 12 aircraft and its thanks to Graham Wullf that my love affair with the Aero Commander started.